Forum Index > Off-topic Talk > Balance in Lord of the rings swords? Posted: Sun 25 Jun, 2006 6:28 am Post subject: Balance in Lord of the rings swords? They ar beautiful in appearance but i not so sure about use. I would greatly appreciate you help. Posted: Sun 25 Jun, 2006 6:38 am Post subject: Re: Balance in Lord of the rings swords? Hello and welcome to myArmoury.com. Are you talking about United Cutlery's LOTR swords? If so, they have two versions, a regular one and what they call a museum-grade or something. The regular swords feature the same construction things we see on their other swords: stainless steel blades and hilts of cheaply cast metals and plastics. The tangs are often welded on, and not welded well. The construction is generally lacking in quality and security. Even if the balance was good, they probably would not be safe for anything besides very light swinging around through the air. The "museum collection" supposedly use full tang construction and non-stainless steel blades. They're advertised as fully functional and are pretty pricey. I haven't seen any reviews of these. On the other side you can go for a customized Christian Fletcher / Angus Trim sword. They would certainly be of better quality than any actual official LOTR repro (and most of the time less expensive than the M.C. ones). I have the Witchking, Sting, and Glamdring UC swords (regular grade). They are blade heavy and unwieldy at best with poor balance. They are great for the purpose intended--decoration. I have no experience with the museum-grade swords. Posted: Sun 25 Jun, 2006 4:20 pm Post subject: Re: Balance in Lord of the rings swords? Here's a Ranger sword offered from Pro Sword. Anyone out there have one? Posted: Sun 25 Jun, 2006 7:39 pm Post subject: Re: Balance in Lord of the rings swords? Posted: Fri 30 Jun, 2006 9:03 am Post subject: Re: Balance in Lord of the rings swords? I own the regular version of Sting and Glamdring, as well as the MC Sting. The Sting sword is fine for what it is. Glamdring is very heavy though, and whenever I hold it I put a hand on the blade. It just feels that there is so much stress put on that poor tang. I have heard that the MC line is perhaps as good as MRL, but have also heard that the hilt is probably made from the same cheap cast metal of the original. Descriptions of Peter’s sword from Narnia actually say that the pommel is brass and that the guard is chrome-plated steel. United Cutlery didn’t mention it, so it is likely not steel, but “solid” metal, just like the regular versions. In short, the regular LOTR line is an odd combination of being overweight and delicate. They are not well balanced. If you ever want to swing your swords, you will need to look elsewhere. Of course, they are fine for display. Pretty much all of this has been said before. I still like LOTR swords; probably because their designs are somewhat functional. The original swords for the films were made by New Zealand smith Peter Lyon of Lyonesse Armoury (http://www.swords.co.nz/). As far as I know he no longer takes orders as he now has plenty of work in the film/TV industry. The website is old and hasn't been updated in years. I have the Narsil. From a distance, it somewhat resembles an Albion Regent. It's a beautiful sword and looks great on my wall. It will likely be the first sword to grab your attention despite being flanked by my Albion Talhoffer on one side and my A&A Schloss Erbach on the other. But then again that's the whole idea of what it was made for. 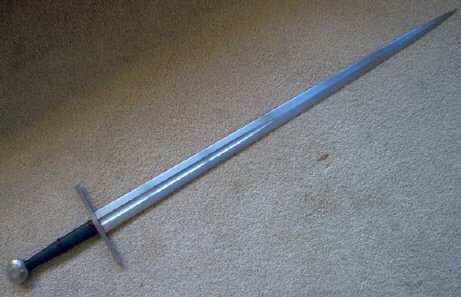 My Narsil is quite heavy, even for a 52-inch sword. And the fact that it's very blade-heavy is all the more reason to not test cut or spar with it. I have enough sharps and a couple wasters for that. Yeah, as Jay said they were made by Peter Lyon, as well as the crew at WETA workshop, which made all of the costumes, equipment, models, conceptual art, etc. for the LOTR movies. You are right about the Viggo Mortenesen thing. In the extended version of the movies, they have about an hour long documentary about the weapons, armour, and battles in the movie. The Sword Viggo used was a stunt sword, but I guess was made from spring steel and was pretty authentic. Of course, it was blunt, as well as having rubber molded into the crossguard so it would absorb the abuse it was given. Not at all authentic in that respect. I'm pretty sure they made "real" blunt steel swords, aluminium swords for fast action scenes, and even rubber ones for "safety reasons". The swords you see Aragorn using are probably several different swords, you know, the real steel version for close-ups, others for fight scenes. So for many fans, it's probably just having a piece of cool looking merchandise from the movie hanging on your wall like a statue that you don't really think of using at all.